When applying multiple coats of varnish, With each new coat of varnish, the surface may potentially get a little bit more uneven as the varnish may not sit evenly on surfaces, especially surfaces that are not horizontal. A light sanding between coats is not enough to level this out. This results in a smooth, but slightly wavy surface. On finishing some work, it occurred to me that instead of sanding in between coats, I could try to use a cabinet scraper on the flat surfaces. This worked better than I thought it would. The surface felt smoother with just one pass of the scraper, so sanding wasn't necessary. In addition, any bumps I had in the finish got leveled by the scraper. 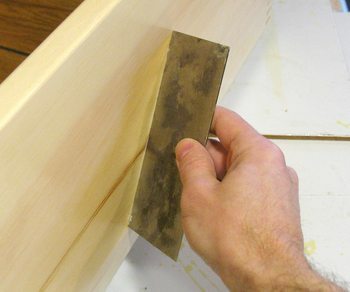 This approach isn't suitable for after the final coat, as the scraper can leave some light scuff marks where it caught uneven parts of the varnish. But up to that point, scraping instead of sanding will result in a flatter, smoother finish than just sanding.